Testimonials from a few of our past customers. If you are a past customer and have a story to tell us about your dog, please let us know by emailing us. 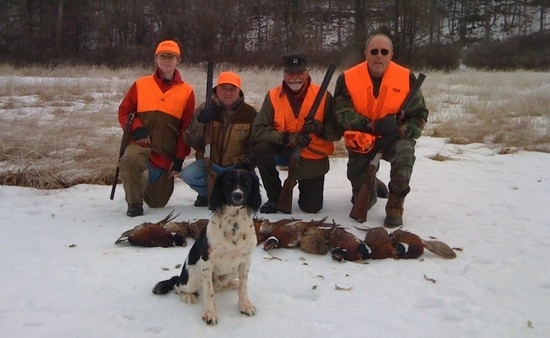 Bob and Jared: When we bought Harry our GWP pup which is my first bird dog I had to make the decision whether I would try to train him myself or have a professional do it. Harry is a house dog and my family is very attached too him and I had my doubts in trusting someone else with his welfare. After speaking to both Jared and Bob on the phone and visiting their kennels and training area I decided to put my trust in them. What made the decision for me is how nice and clean the kennels are and the calm and patient demeanor with Harry that Bob and Jared showed. I could go visit him and watch his training whenever I wanted. After 3 months Harry came back home and I have had him back for a year now and I am very happy with him in the field, sometimes I'm just amazed at the things he can do. Another great thing is if I ever have a question on handling Harry or how he is hunting they are just a call away and are happy to help whenever needed. Hopefully in a couple years I will have another pup to send off to Boberosa. Bob and Jared, Thanks so much for all your work with Zeke. I brought you a pup and you returned him a finished hunter. Every time we have been out, I think he has out hunted the other dogs he was with. I appreciate the time and care you took in training him. I also liked the updates you provided me while training him, as well as the time taken to train me when I picked him up. 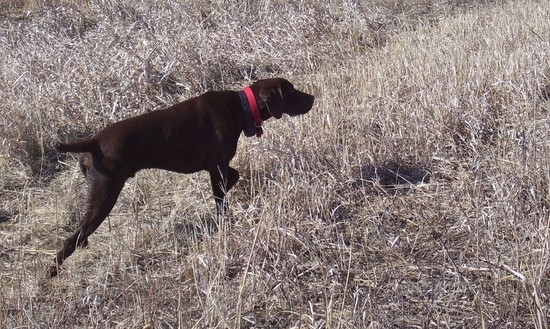 We are in the process of planning another trip to Iowa after pheasant. I hope he is as excited as I am to go get them. Bob and Jared, I just wanted to take a few minutes out and thank you once again for the newest member of our family, Bonzai. He has been a member of our family fourteen months now. I hunt him at least once a week on pen-raised pheasants, wild grouse and woodcock. He excels at all three. He is dynamite in field, and turns it off in the house. He is all you claimed him to be and more. My whole family has hunted over him as well as many friends. He is the talk of my gunclub as well. Thick standing corn, briars, thickets, heavy cover, steep hills, nothing seems to phase him. As you are aware, I acquired him from you without ever seeing him by way of the internet and phone. I appreciated the honest and accurate description and that you gave of Bonzai. In my opinion, I think you undersold him. He is better than you described. If you have any prospective clients that want to talk to owners of your dogs, I would be glad to speak with them and would recommend you highly. I have enclosed a picture of my son and some friends with Bonzai from this past Sunday. On behalf of myself and family, Thank you!